Vuk Jeremić is the President of the Center for International Relations and Sustainable Development (CIRSD), a public policy think-tank based in Belgrade, and Editor-in-Chief of Horizons – Journal of International Relations and Sustainable Development. In June 2012, Mr. Jeremić was directly elected by the majority of world’s nations to be the President of the sixty-seventh session of the United Nations General Assembly in the first contested vote since the end of the Cold War. During his term in office he launched the negotiations that led to the 2030 Agenda for Sustainable Development. As President of the General Assembly, he also facilitated the adoption of the breakthrough Arms Trade Treaty, the first legally-binding instrument in UN history to establish common standards for the international transfer of conventional armaments. Mr. Jeremić initiated several high-level thematic debates in the UN on critical issues such as climate change, education, social inequality, credit rating agencies, international criminal justice, and the peaceful resolution of conflicts in Africa. A record number of world leaders participated in them, helping the UN General Assembly assume a more pronounced role in world affairs. Mr. Jeremić served as Serbia’s Minister of Foreign Affairs from 2007 to 2012. During his tenure, he paid official visits to over 100 countries, and addressed numerous international summits and conferences. In 2007, he chaired the Council of Europe’s Committee of Ministers. In 2011 and 2012, Mr. Jeremić led Serbia’s successful campaign for the Chairmanship-in-Office of the Organization for Security and Co-operation in Europe (OSCE) for the year 2015. 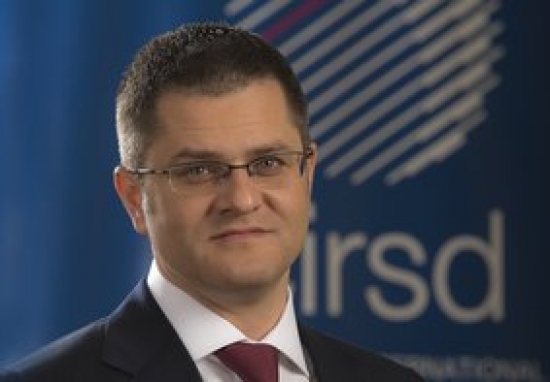 Prior to becoming Foreign Minister, Mr. Jeremić served as an advisor to the President of Serbia and various government ministries. Before entering public service, Mr. Jeremić worked in London for Deutsche Bank, Dresdner Kleinwort Benson, and AstraZeneca Pharmaceuticals. Mr. Jeremić holds a bachelor’s degree in Theoretical and Experimental Physics from Cambridge University and a master’s degree in Public Administration/International Development from Harvard University’s John F. Kennedy School of Government. He was named a Young Global Leader by the World Economic Forum in 2013 and appointed to the Leadership Council of the United Nations Sustainable Development Solutions Network (UN SDSN) in 2014. Mr. Jeremić served as the President of the Serbian Tennis Federation from 2011 to 2015. He is married to Nataša Jeremić.